Skype for Business is the new name for the new version of what used to be Lync, Microsoft's unified communications software and service – but changing the name was only the beginning, BJ Haberkorn, the director of Skype for Business, told TechRadar. In Windows what users see with the Skype for Business Client is much more like what people are already used to with the consumer Skype service. The idea is "to make Skype for Business really easy to adopt" and Haberkorn explains that you get "everything that was in Lync with a UI inspired by Skype – everyone from my four-year old daughter to my seventy-five year old mother knows how to use Skype." That includes a 'call monitor' view that appears when you switch to another application to do some work, with a thumbnail video window and controls to hang up the call. That's in the Windows client now; Android and iOS clients for Skype for Business will be available by this autumn, with Skype for Business for the Mac coming by the end of 2015. Haberkorn emphasises that along with Skype-style features like being able to find Skype users by searching for their name and location, so it's easy to add them to your address book and make a video call to them, you still get all the features from Lync. That means you can still share your desktop (or a single program that you're running), or upload and present a PowerPoint file. Working with those files is getting easier because you will be able to attach the documents to the meeting – including Word and PDF files that you want to share, even if you're not presenting them as a slideshow. They'll be stored in OneDrive for Business with permissions that mean everyone in the meeting will be able to open them, edit them and save them back in the same place, and they'll be easier to find because they'll be on the sharing menu in the Skype for Business app. The idea is to reduce the time you usually waste at the beginning of a meeting making sure everyone has access to the files you want to talk about. And with the next version of Office (including Office Online), you'll be able to link co-authoring of a document to a Skype for Business meeting. Office Online will have a Skype button so you can start a chat from the document, or you can start a co-authoring session from the Skype for Business client where you're already having a conversation. When you choose a file to work with, it doesn't just open on your computer – it opens on screen for everyone who's in the meeting, and again OneDrive will take care of getting the permissions set up, so everyone can edit it. 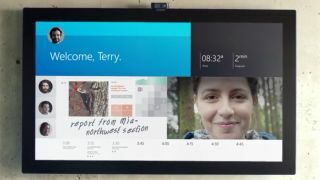 That's for remote meetings – when you have people in the same room and maybe some calling in as well, Microsoft's Surface Hub has Skype for Business built in as well as OneNote for writing notes on a digital whiteboard. And there are new hardware devices that turn existing conference rooms into 'Skype for Business rooms' (the new name for Lync for Business rooms) from partners like Polycom and Cisco. "There are something like 50 million meeting rooms in organisations around the world," Haberkorn points out. "Something like a million of those have something like a formal meeting room system, the other 49 million rooms have projectors, they have big TV displays on the wall. "The Polycom Roundtable 1000 is a small computer with a speaker and a camera that you attach to a monitor – it's got a Polycom USB speakerphone. It connects to existing projectors and TV screens to bring the 50 million conference rooms with those things into the modern virtual world. Plug in power and HDMI and two USB devices, and now you've enabled this as a Skype for Business room."